Want to share all of you’re amazing purchases after this season’s holiday sales, but you don’t want to post them all over facebook? Sick of looking at pictures of what everyone else is buying and wish they would take it elsewhere? Well you’re in luck. The new iPhone app, Trace is determined to make a new social network that allows people to share their best purchases with all of their friends who want to see them. “Things get lost on social networks,” says Ryan Stevens, Trace founder and CEO. If you saw a dress while scrolling through your instagram account, it’s almost impossible to go back and find. 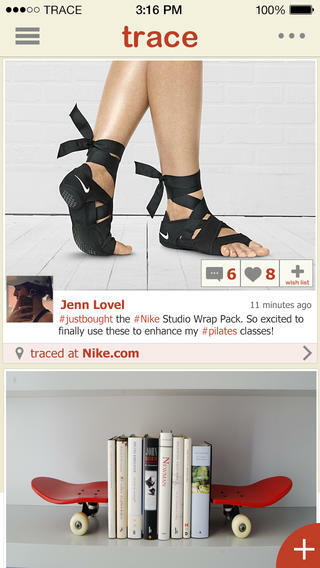 With Trace, you can go look at what all your friends are buying when you’re in the mood to shop. It will also save you from showing up to a party wearing the exact same outfit as your friend. The important thing to remember about Trace, is that it’s not looking to share dollar amounts with anyone. Other shopping apps like lifestyle apps like this have failed because people don’t want to see other people brag about their designer clothes, or give their credit card information out to an app they don’t trust.